 We do not currently have enough stock to meet the quantity requested. We have 24 available. If you would like to order more than 24, please call in your order to 1-800-TEACHER. 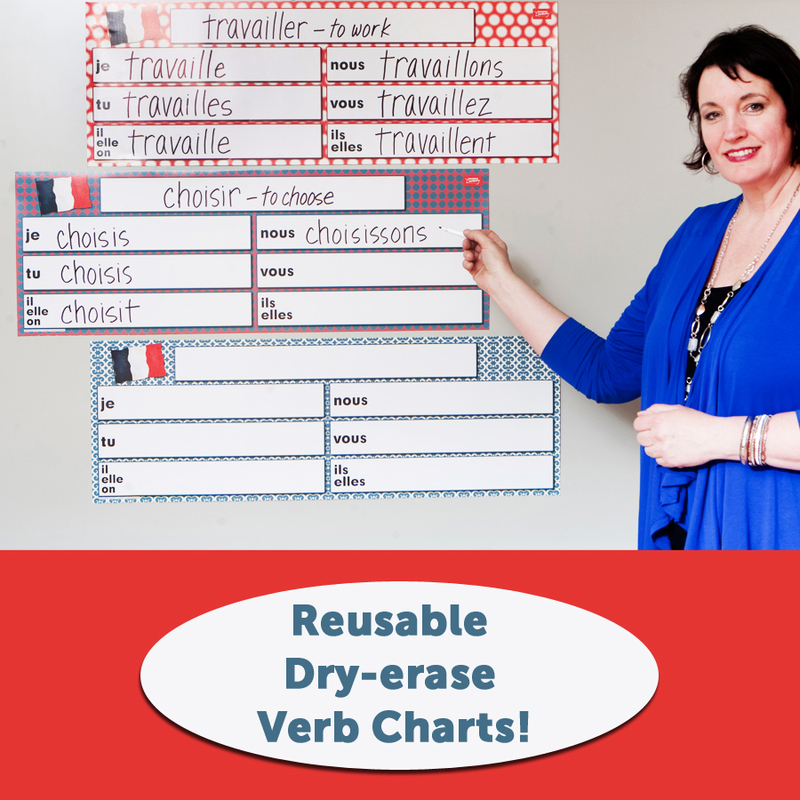 How Did I Live Without Dry-erase Verb Charts? 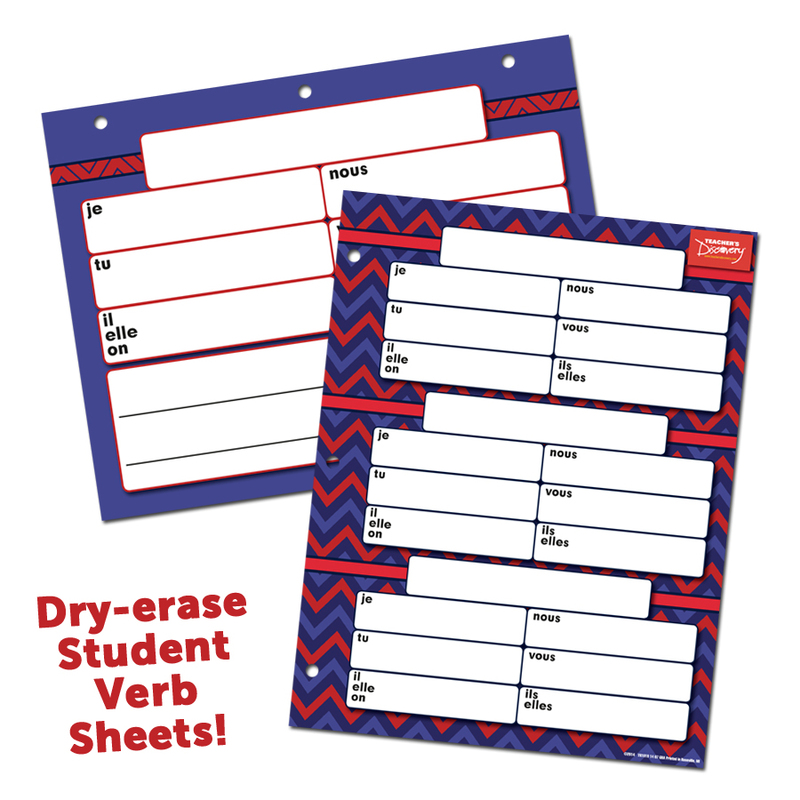 "How Did I Live Without Dry-erase Verb Charts?" That's the question you'll be asking yourself when you start using these! - Slap them up on the board to demonstrate conjugation quickly - they cut down the amount of writing you have to do! - Put them up on the wall to show students different -er, -ir, and -re verbs every week! 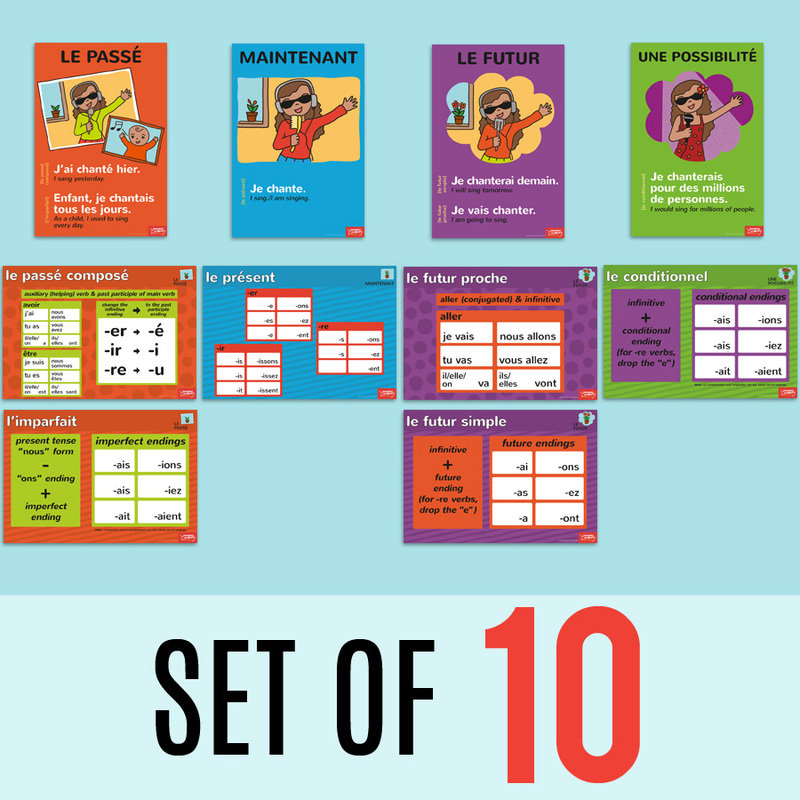 - Use them for a classroom game of competitive verb conjugation - invite three students up to the board, tell them a verb and see who can fill in the correct conjugations first! 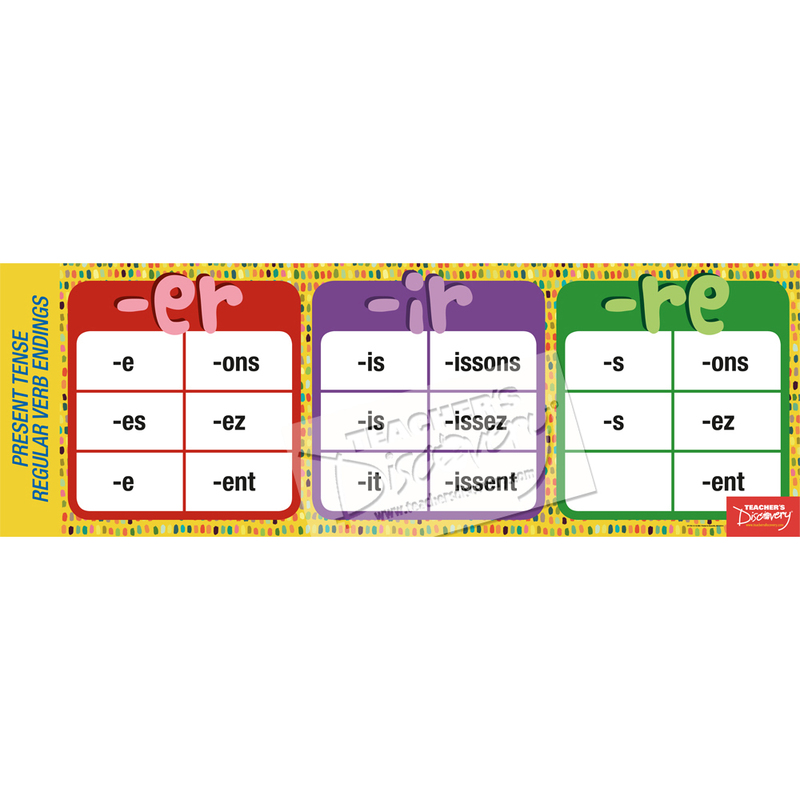 Three 13 x 38-inch laminated verb charts, three dry-erase markers. - Use only the black Dri-Mark® brand dry-erase markers that came with your verb charts (1W0008 Black Dry-Erase Marker).  - Do not leave the same writing on the charts for weeks or months. Erase charts when they are not in use, or change what is written on them often. 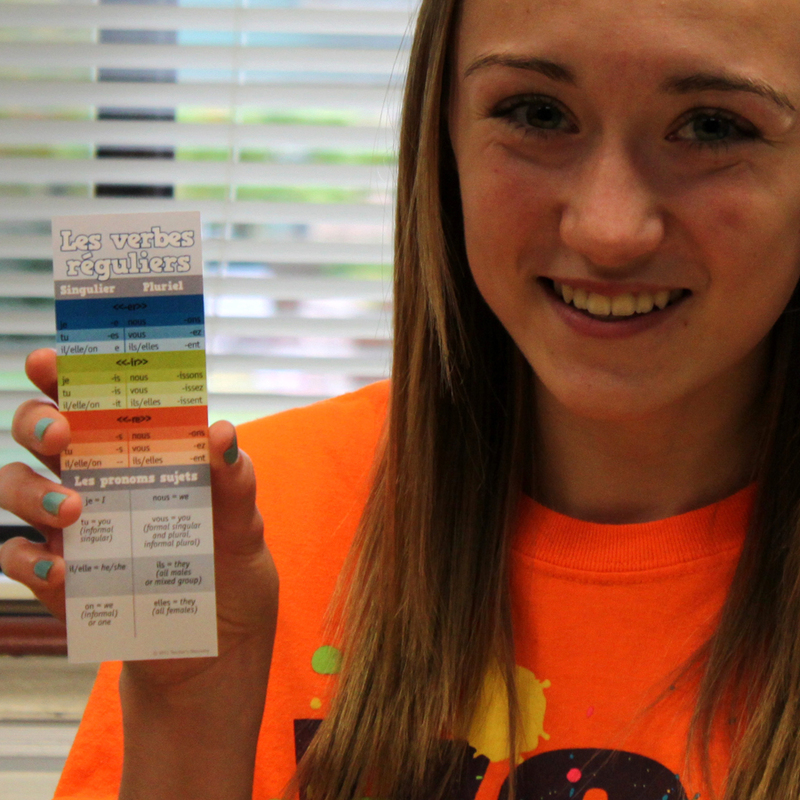 If the whiteboard in your classroom is magnetic, add magnetic strip to the backs of your verb charts for easy hanging! It is a great idea to be able to easily erase and use this poster as a white board. However, it is so difficult to erase that the posters have to be taken down just to clean them. White board cleaner does not work, or orange polish, pledge, windex, or even Clorox. We are having to use white board marker and an abrasive (Comet). I started using this company in the early 80's when everything I bought was high quality. Take a pass on this product. 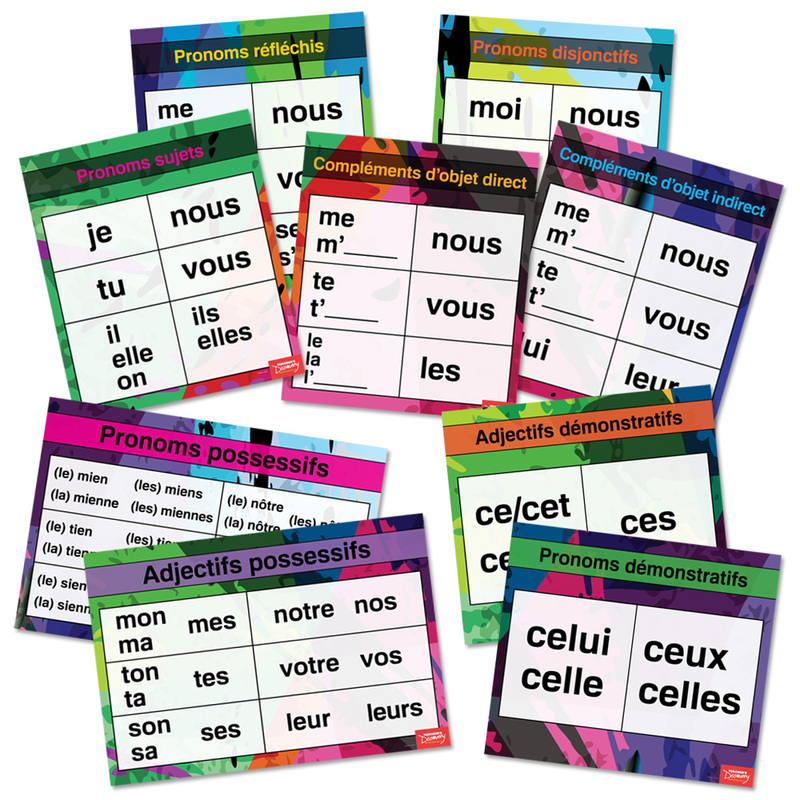 These verb charts are a great resource for me and my students. I look forward to using them for many years to come! I bought these thinking it would make my life easier. It's a GREAT idea but it does not erase. I used Expo markers and nothing came off, I used the expo cleaner and nothing came off. I also though the plastic would me more durable. Its just laminated paper, Its not even the good thick laminate. I only used one and the rest are stuck in my closet, More of a hassle than anything else. I felt dupped. Staff's Response: Hello Rosa, I'm sorry to hear that the charts didn't work for you. It's definitely not our intention to dupe anyone. We have done extensive testing with the charts using different types of dry-erase markers and come to the conclusion that certain markers erase much better than others. The black Dri-Mark brand markers that come with the charts are the best we've found for erasing cleanly, so we recommended using only those. Some teachers have found that whiteboard spray and magic erasers (for stain removal) work well but we can't recommend any specific stain removal products because we haven't done testing with them. According to our tests, with the right marker it is possible to get a lot more than a few months out of these, but it all depends on the conditions in which they are used - how often, with what type of markers and cleaner, direct sunlight might play a role in staining, etc. They are a paper poster with a special dry-erase laminate, so even under the right conditions their lifespan will be shorter than the writing surface of your classroom whiteboard which is much tougher. BUT, all that aside, we have a 100% satisfaction guarantee - http://www.teachersdiscovery.com/returns/ - so any time a product doesn't work for you, we hope that you will contact us for an exchange, replacement, credit or refund. Thank you for taking the time to leave a review, your satisfaction is very important to us. Great idea, but at this price they should be magnetic. They do work well for what they are, however. I like how they are laid out and they are easy for my students to read. Actually I would have given these a higher review but I found them to be pricey for only 3 of them. The other problem I am having with them is that they don't clean off easily like a true white board does so make sure you have lots of cleaner close at hand to make your job easy and not have to spend time scrubbing them off. Otherwise I find them very helpful and my students seem to like them. 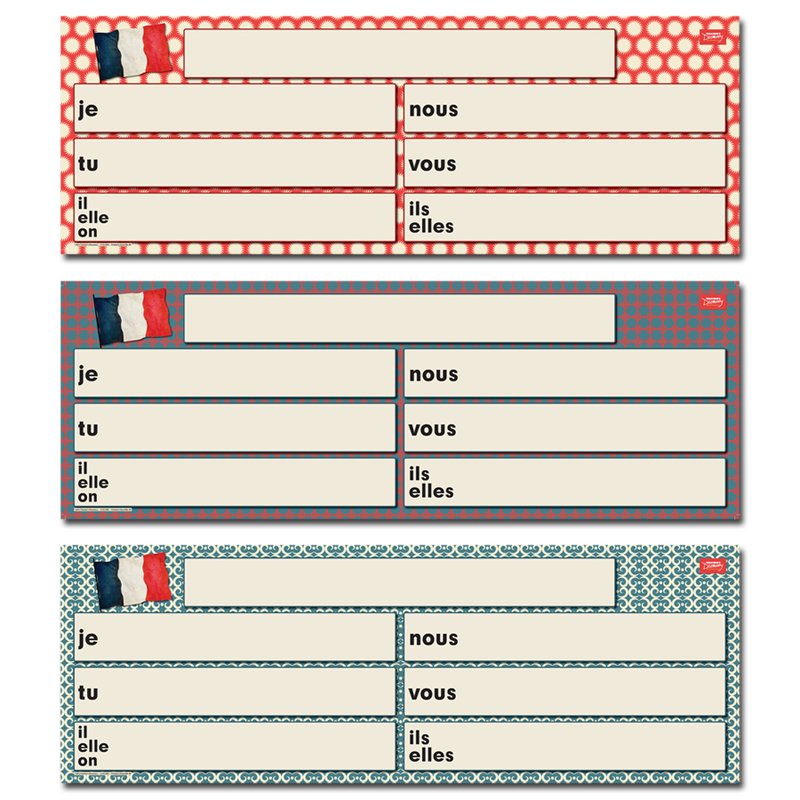 Saw this in the new French brochure and knew it would be useful. Comes in a package of 3 which is ideal for me in terms of my small upper level classes. Ideally offering some deal with 5/package would be great. They do not come with magnets but different teachers use different resources. Make sure you have wipes nearby to keep things clean. As many things on TD...a bit on the pricey side but useful if you want to limit the amount of cleaning on your own board or get a nice thorough verb review.